Meeting deadlines for getting projects completed is important, but safety should be a real focus in any roadside work zone. Quality intelligent safety equipment provides a way to manage the site easier and more effectively. It is the right thing to do for your work force and the traveling public. No matter how experienced an individual is, someone flagging traffic can make errors that cause accidents, injuries and even fatalities. Modern intelligent work zones depend less on taking a chance with human error and leave much of the traffic control to technologically advanced equipment. Signs, lights and warnings can all be given using durable, portable units made for constant outdoor use. These items can be rented, or purchased at a reasonable price as a pre-owned product. Driving a motor vehicle nowadays requires the ability to tune out a lot of distractions. Cell phones, talking passengers and drifting thoughts can take their mind off of the task at hand temporarily. Slight distractions can lead to deadly accidents. There have been a few work zone accidents in which the driver complained they did not see the person flagging them to stop. Obeying traffic lights seems to be second nature to most driver's. 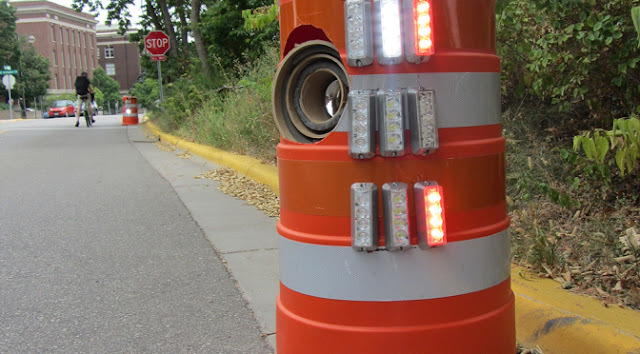 Setting up portable traffic signals is one way to make is easier for vehicles to see whether they are required to stop. Every work zone job is different and may require specific instructions to keep traffic flowing smoothly. Utilizing tailored warning messages allows you to impart the exact information people need to pass by the work zone safely. The signs can be changed to fit the needs of the job at the time. An easy way to manage the safety of the work zone and catch violations is to use a trailer mounted camera system. It can provide needed evidence in cases of hit-and-run, or equipment theft. The images provided are clear and will allow you to assist law enforcement in times of investigating thefts, vandalism or accidents.